By Meredith Mazzotta on October 5, 2010 . In a much anticipated announcement during the Replenishment Conference in New York on Monday and Tuesday this week, the Obama Administration revealed a $4 billion pledge to the Global Fund to Fight AIDS, Tuberculosis and Malaria over the next three years. 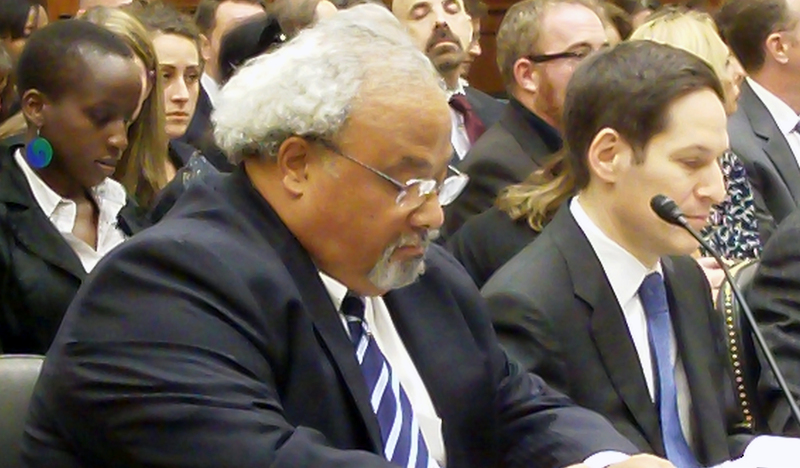 Ambassador Goosby prepares to testify last week at a hearing on PEPFAR in front of the House Foreign Affairs Committee. U.S. Global AIDS Coordinator Eric Goosby, MD, spoke to reporters Tuesday morning about the administration’s support for the Global Fund, emphasizing a firm call to action that the Fund make much-needed reforms to ensure investments and expanded ability to save lives. Goosby outlined three goals for the U.S. pledge to the Global Fund that “would allow the Fund to do its job and do it better:” to drive needed reforms and ensure smart, effective investments are being made utilizing an action agenda that includes clear timelines; to leverage other donor nations to make pledges; and to show continued U.S. leadership and commitment to saving lives. “Even in these difficult times, the U.S. is committed to combating these diseases and ultimately saving lives,” Goosby said, adding that the U.S. by far is still the largest contributor to the fund, having donated $5.1 billion to the Fund to date. When asked specifically what reforms the U.S. is proposing, Goosby said the Global Fund Secretariat had already begun an internal revision of internal systems to make them more rapid and more responsive to issues at the country level. He emphasized the importance of the ability to rapidly put resources on the ground, monitor how well the programs interface or do not interface with target populations, and allow for self-correcting mechanisms in order to get better and better at serving populations. He also mentioned integrating Global Fund efforts with other multilateral efforts in order to integrate resources and have a bigger impact. This is the first time the U.S. has participated in a 3-year pledge. “It’s a smart change in the way we support the Fund,” Goosby said, and it allows the Fund to change its trajectory to plan strategically over three years rather than just one. Although the U.S. pledge represents a real increase in its financial commitment, this funding level together with pledges made by other donor nations in recent weeks, will likely prove inadequate to fund all meritorious proposals by developing countries to combat HIV, TB and malaria. Many had hoped for a $6 billion contribution from the United States. Goosby agreed that there is still enormous unmet need that this contribution fails to meet, but held that the U.S. was maintaining the commitment it has made from the start. “We really tried to carefully understand what the burden of commitment was to continue those programs from Round 1-9 that we had already committed to supporting, and we also feel that the resources that we put forward— $4 billion over 3 years—addresses that,” he said. Fulfillment of this pledge will require annual congressional action. With at best a probable $1.125 billion U.S. contribution to the Global Fund for fiscal year 2011 still pending before Congress, the administration will have to significantly increase its Global Fund budget request over the next two years to meet the $4 billion goal. Global health advocates will be advocating before Congress for even higher U.S. contributions over this three-year period, as will some members of Congress. This entry was posted in Budget, U.S. Policy and Funding on October 5, 2010 .